Card- Saying from Isaiah 40:31. A beautiful photo of an Eagle coming down for a fish. "Sunflower" card with-- Thoughts of you keep running through my mind. 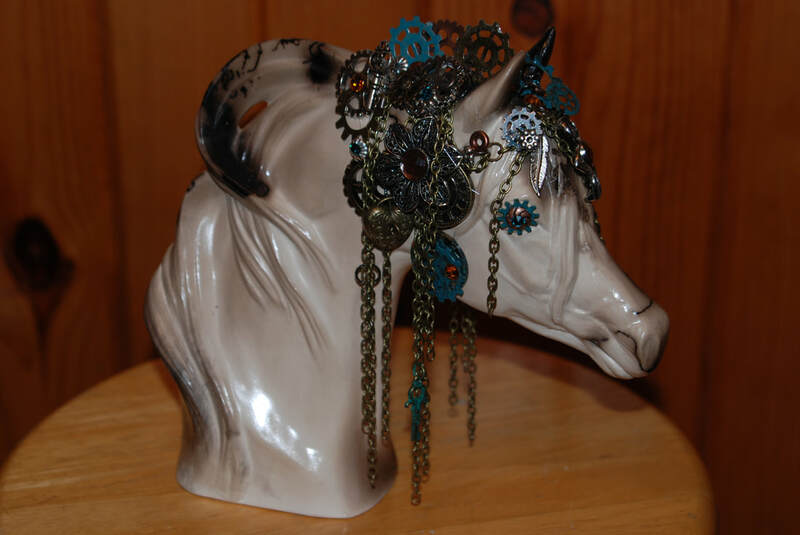 HORSE HAIR FIRING Steam Punk Arab bust. We include a variety of clay products as well as photography, and photography gift-ware. There are some reprints of paintings and computer art., done by Katie. Kathy has been putting things on our FaceBook page...Katie-did Handcrafted Giftware, that hopefully is a combination of things that are fun and interesting to learn about, as well as new products, and photos. Recently Kathy started a facebook page for the AMS ART CLUB in Nekoosa. Kathy, also known as Katie-did, is a ceramicist, but at times does other art interests-- the love of creating for her started before kindergarten. By simple definition a ceramcist is someone who works in clay. Using slip casting as well as hand building , Kathy works mainly in earthenware, a low fire clay, with a variety of techniques Some of her pieces combine both hand building and slipcasting, with slip trailing and under glazing, and fired on gold. The Horsehair Firing is a technique that requires the piece to be removed from the kiln while very very hot. As does the technique Raku. Some of the ceramic pieces are functional, which would make them food safe, while others, either because they are so delicate or are not food safe are just for aesthetic reasons. Horsehair Firing would fall under the aesthetic type of art. HORSE HAIR FIRING has become memorials for horse owners, as well as trophies for equestrian shows. I use the hair of the actual horse that is being honored. The design that the burnt on horse hair leaves is unique to each piece. Sam loves to study nature through his lens. He loves the "hunt" and takes it seriously. It is fun to really get to see whats out there and take notice of what sometimes is just in our own back yard. The camera doesn't always see what we see, once in awhile it will actually make something look cooler, but for the most part your eye is a wonderful tool, and can't be compared to the simple photography your camera takes. I am sure that it is due in part to the rest of the senses you use while out there taking pictures. For example, the breeze blowing, loons calling, the lap of the waves, these are all things you can't include even in the most fantastic photo. Winter in Wisconsin---got to love it!!! !